Mawson's Huts, Cape Denison, Antarctica: While looking for suitable shore-side landing spots for guests travelling on board the visiting expedition ship Orion, Mawson's Huts Foundation team member Mark Farrell has uncovered remnant metal piping from Douglas Mawson's single-propeller mono-plane, taken with Mawson almost a century ago on his 1911 Antarctic expedition. Built just eight years after the Wright brothers' first flight, this aircraft was the first produced by the Vickers factory in Britain, and the first taken to either polar region. 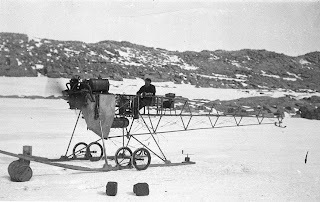 Transported to Antarctica without its wings, (removed in Australia following an accident during a demonstration flight prior to departure) the plane was used for a time as a motorised sledge. The "air tractor" was eventually abandoned because its Vickers engine succumbed to the extreme temperatures, described by Mawson as having "developed an internal disorder". The plane was last seen in the mid-1970s when Antarctic researchers photographed the ice-encrusted fuselage. Unusually low tides, (assisted by a blue moon*), in combination with unprecedented melting of ice had exposed the rusty remnants, found on New Year's Day 2010. It is understood that remains of the larger segments of the plane, which have been immersed in sea water possibly as long as 30 years, are still visible and clearly identifiable from archival photos as part of the aircraft. Don McIntyre, Antarctic Expedition Team Leader on board Orion, has reported that the items found have been transferred to the Conservation Laboratory – which was transported as deck cargo onboard Orion to Cape Denison two years ago. In order to help conserve the parts of the plane found, Caustic Soda (provided from the ship's supplies) has allowed the Conservation Team to stabilize the corrosion. Orion Expedition Cruises' involvement with the Mawson's Huts Foundation is part of an ongoing corporate commitment to assist and support the Foundation in their important conservation activities. Taking advantage of excellent weather, Orion's guests were ashore at Cape Denison at 1600 to take a rare look inside the historic Mawson's Huts and surrounding environs, including seeing the tail plane/rudder of Mawson's plane, left in the hut by Mawson when he departed in 1913. Guests on board the last Zodiacs returned to Orion at 23.30 to enjoy celebratory drinks and a warm meal, accompanied by Orion's Expedition Team and 10 members of Mawson's Huts Conservation Team (who took advantage of warm showers and dinner on board in the dining room – a welcome contrast to their life in tents while working on site). The Australian Antarctic Division will decide whether to return the remains of the aircraft to Australia for specialist treatment or leave them at Cape Denison. Orion Expedition Cruises Managing Director, Sarina Bratton, has offered to transport the items back to Australia on board Orion.